Gurudwara Bangla Sahib is one of the most important and famous Sikh Gurudwara of Delhi. Bangla Sahib Gurudwara is located on Baba Kharak Singh Marg near to the Connaught Place area of New Delhi. Sacred Heart Cathedral Church is opposite to Gurudwara on the other side of the Gol Dak Khana Roundabout. 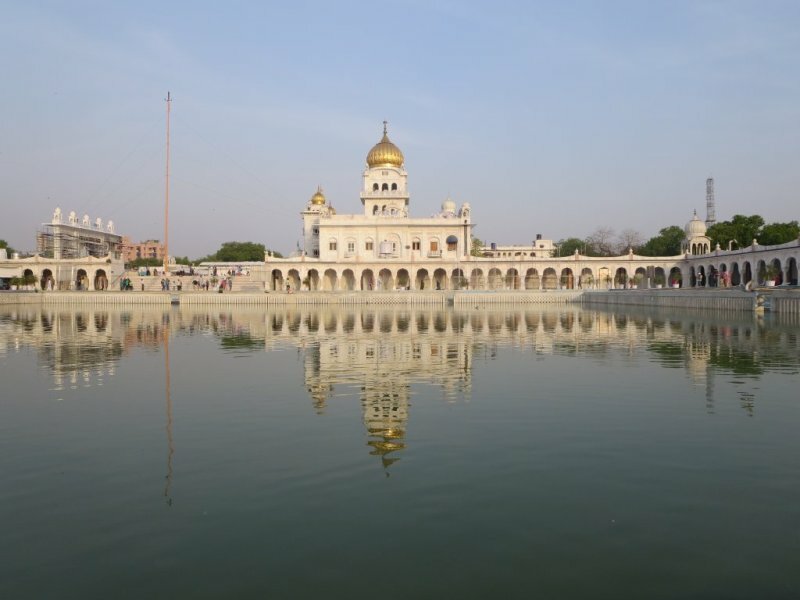 Bangla Sahib is known for the association with eighth Sikh Guru, Guru Har Krishan. Gurudwara Bangla Sahib is located inside a bungalow belonging to Raja Jai Singh. Raja Jai Singh was an Indian ruler of the 17th Century. 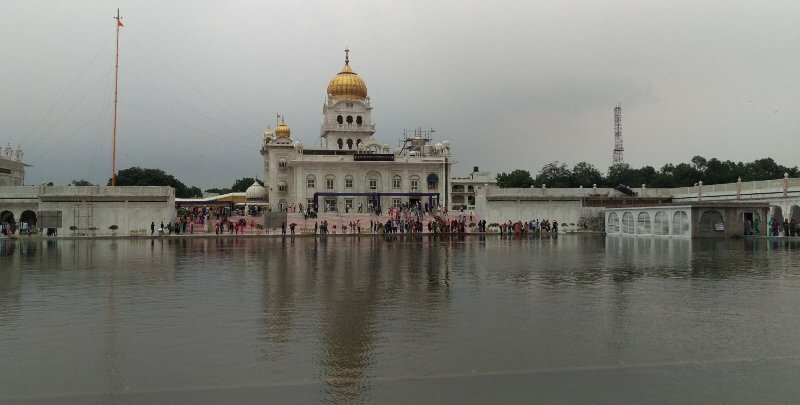 Bangla Sahib Complex has Gurudwara, A Sarovar (Holy Pond), a school and an Art gallery. Sarovar is very large in size with abundance of fishes. The kitchen serves the free food (Langar) to all, regardless of any race, religion or caste. 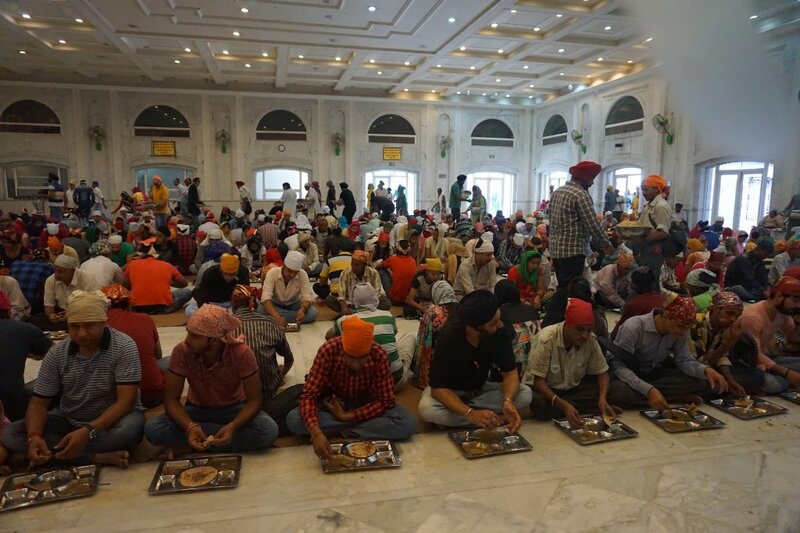 Anybody can eat in the Langar hall free of cost. Food is prepared by Gursikhs who worked here and anyone can volunteer in the services of Gurudwara. Baba Baghel Singh Museum, a library and a hospital are located inside the Gurudwara Complex. Bangla Sahib Gurudwara remains open on all the time of day from 12 AM to 12 AM. Entry is free for everyone (Indian and foreigners). The kitchen serves Langar 10,000 to 15,000 devotees daily. Generally Langar starts 9 AM in the morning and run till 3 to 4 in the afternoon. It again starts 7 or 8 in the evening and runs 10 to 11 in the night. The Langar menu consist vegetarian meals which has chapatis, Dal (Pulses), Sabji (Vegetable Curry), Kheer (Sweet Dish) etc. Also many devotes are distributing and offering free food to all outside the Gurudwara even in the wee hours. If you are visiting the Gurudwara make sure to take Karah Prasad. Langar timings can be varied as per the season and occasion. Bangla Sahib Gurudwara is a sacred place for Sikhs. Please maintain the dignity of the place by following some tips. Cover your head with a scarf or handkerchief while entering into the Gurudwara, Head scarves are available in the baskets near the entry gate at free of cost. Kindly wear the clothes as per the place. Shoes are not allowed so deposit your shoes at the shoe counter at free of cost. Maintain silence during the visit and follow are the rules and regulations of the place. Photography is allowed outside the Gurudwara in the campus. Beware of pickpockets inside the complex. The multilevel parking facility is available for the convenience of visitors. Gurudwara and Langar has an Air conditioning facility. Shoe racks are available free of cost for depositing the shores. Drinking water facility and clean washrooms are located inside the complex. I am not sure about Cloakroom facilities; I have read in some forums that cloak room is available in the complex. The nearest Metro station is Shivaji Stadium of Airport Express line. It is just 500 meters from here and 5 minutes walk is sufficient to reach here. Patel Chowk Metro station on Yellow line and Rajiv Chowk Metro station of Blue Line are around 1 KM from here and 10 to 15 minute walk is required to reach the Gurudwara. Delhi Metro is the best mode of transport to reach here. Visitors can reach here via Auto, Taxi or city bus. Bangla Sahib Gurudwara has 47 rooms and 2 halls. 39 Rooms are Air-conditioned and 8 rooms are non air-conditioned. Rooms have attached bathrooms. AC room charges are 1000 Rs. per day and for non AC rooms traveler have to pay 800 Rs. Hall can accommodate 500 people and stay in the hall is free. Also check Gurudwara Sis Ganj Sahib of Chandni Chowk. Do visit other religious places of Delhi like Lotus Temple, Chhatarpur Temple, Iskcon Temple, Prachin Hanuman Temple (CP), Birla Mandir, Jhandewalan Mandir, Akshardham Temple, Kalkaji Mandir of Delhi.